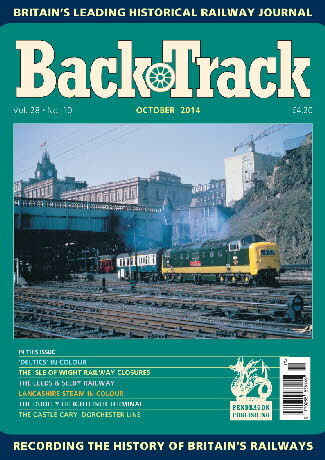 Railway Magazine | BackTrack October 2014 journal from Pendragon Publishing. The Isle of Wight Railway Closures - Part One - Edward Gibbins examines the first closure proposals and counter-arguments in the 1950s. The Leeds & Selby Railway - Jeffrey Wells presents the history of the first railway to Selby. Lost Chords and Earthworks - Part Two - R.A.S. Hennessey concludes his survey of railways that never quite happened. Lancashire Life - four colour pages of steam in 1963/4. 'Deltic' Delights - four colour pages of the popular English Electric East Coast route diesels. In Terminal Decline - Alan Jeavons reviews the fate of the Dudley Freightliner Terminal. To Scarborough for the Summer - archive photos of the traffic at this famous seaside resort. The Castle Cary to Dorchester Line - Stephen Roberts describes a cross-country GWR route. Lead On: The Whys and Wherefores of Locomotive Valve Gear - Part Three: Small can be Mighty - The concluding part of Miles Macnair's technical survey. Welsh Waysides - six pages of evocative colour photos of rural stations from before the Beeching closures. Gristhorpe Crossing Box - a rural location on the Hull Scarborough line visited by Peter Butler.